← Don’t like 3D, but still want to watch 3D movies in the theater? 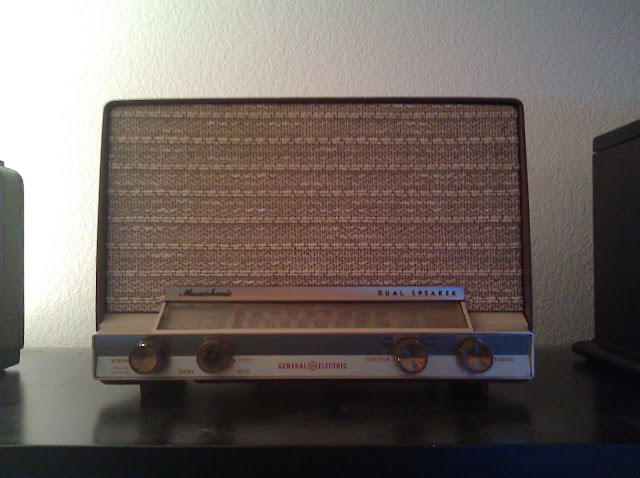 I recently got around to fixing up my GE Musaphonic T-210B, a relatively nice tabletop tube radio from 1963. It has two medium-sized speakers, AM and FM with automatic frequency correction with 8 tubes. When I was a very young kid, I loved taking stuff apart to learn how it worked; it’s one of the great memories I have of time in my childhood with my maternal grandparents. They brought me this one time and even at a first grade age I realized it was something special and was careful not to destroy it. It hung around for twenty and change more years and finally resurfaced after a deep garage cleaning where I decided I’d take it and give it a good home. Even after all the time, it is actually in good working condition but it’s going to need some service soon so I replaced the filter capacitors and the selenium rectifier with a silicon rectifier and power resistor. I also replaced the discrete capacitors in the radio, 0.047uF at 200V which I also replaced with 0.047uF 60V Orange Drops – for a total of four capacitors that are subject to replacement. There are some couplets with capacitors embedded but I believe they are ceramic and so not really subject to early failure and replacement. When I dug it out of storage, it was dirty and had a torn speaker cloth and damaged board but was otherwise intact. A quick trip to eBay turned up a brand new old stock speaker board and cloth which was an easy swap. I’m happy with the result. It looks nearly out of the box new with only about fifteen minutes of real work. 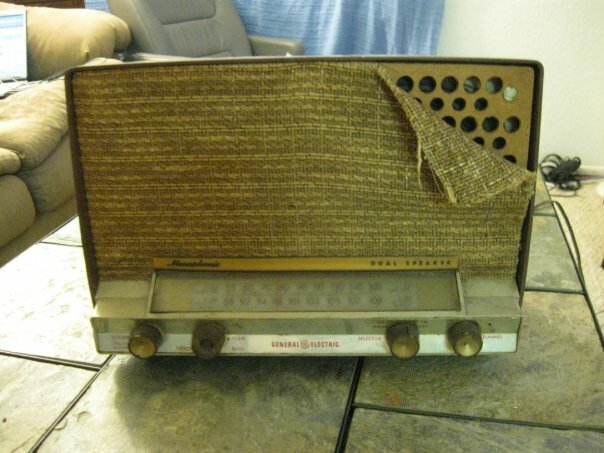 This entry was posted in Projects, Radios and Tubes, Vintage and tagged antique radio, GE, Musaphonic, repair, T-210B. Bookmark the permalink. I have a T210B and when I turn it on, the light for a moment goes on nice and then it dulls and when it finally warms up its not quite as bright. Any thoughts as to how or why the light isn’t so bright? I have one in excellent cosmetic condition. It turns on and I hear a sound of a radio that can’t find a good signal. Does this radio require an antenna to get a good reception? If not, why do you think I can’t get a good signal/channel? Could be anything, really. Weak tubes or leaky capacitors would be my first guess – it’s certainly to the point where the original parts are highly questionable! It probably just needs a good service and overhaul. They might be worth as much as $50 in “as found” working condition, maybe up to $100 if they’ve been reconditioned. Not a hugely collectible piece, but a good performer nonetheless!